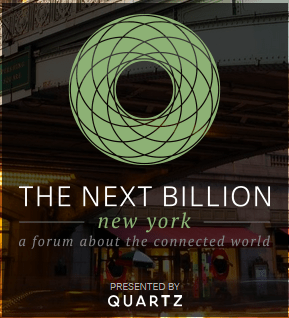 Today, Monday November 16 2015 Quartz will be holding a full day conference The Next Billion – one of a global series exploring the next generation of technologies and strategies that will help companies and individuals around the globe prepare for the next billion internet users to come online. Speakers include: Phil Libin: Founder and Chairman, Evernote; Luis von Ahn: Founder & CEO, Duolingo; Catherine Hoke: Founder & CEO, Defy Ventures; Jocelyn Wyatt: Executive Director, IDEO.org; Lawrence Lessig: Professor of Law and Leadership, Harvard Law School. The event will be webcast live via Quartz’s Livestream Channel.